Gill et al. 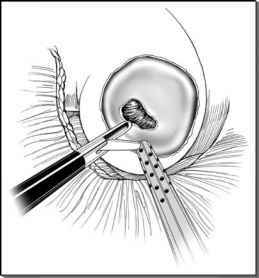 described the initial series of needlescopic transperitoneal laparo-scopic adrenalectomy (16). In this series, 15 patients underwent needlescopic laparoscopic adrenalectomy using three subcostal ports (two 2mm ports and one 5mm port) and one 10 to 12 mm umbilical port through which the specimen was ultimately removed. The needlescopic group had less blood loss, a shorter operative time, shorter hospital stay, and more rapid convalescence compared to standard laparoscopy. Needlescopic instruments are however more flimsy and less reliable than standard laparoscopic instruments, and therefore, considerable laparoscopic experience is required for their use (17). Chueh et al. described transperitoneal laparoscopic adrenalectomy using needlescopic instruments and a clipless technique in which the adrenal vein was controlled with bipolar diathermy using mini bipolar forceps to diathermy the vein over a distance of 6 mm in two to three sequential applications (17). The authors found that convalescence and pain scores were improved but operative time was longer compared to standard laparoscopy (17). Concern has been expressed regarding the sole use of diathermy to control the adrenal vein, particularly on the right side (17). Thoracoscopic transdiaphragmatic adrenalectomy is a procedure that may be of particular use in patients who have had extensive surgery both in the peritoneal cavity and the retroperitoneum.